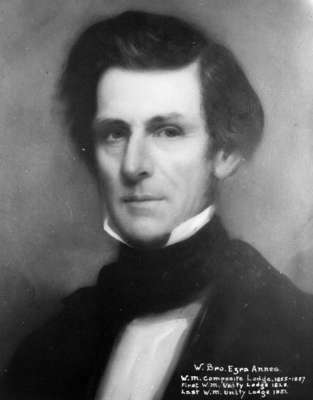 A black and white portrait painting of Ezra Annes. Ezra Annes was born in Vermont in 1796 and settled in Whitby in 1819. He was one of the founders of the Masonic Lodge in Whitby in 1825 and the grammar school in 1846. He served as mayor of the Town of Whitby in 1857, but died while in office on August 25, 1857 and is buried at St. John's Anglican Cemetery, Port Whitby. First W.M. Unity Lodge 1828. Ezra Annes, c.1840, Photographer Unknown. Whitby Archives 31-002-003.